Peter Facey was christened 13 May 1781 in Landkey, Devon. Peter joined the Grenadier Company of the 1st Battalion 28th (North Gloucester) Regiment of Foot in 1803 at Plymouth and served with them until 1820, achieving the rank of Sergeant. He wrote a comprehensive diary of his travels through the Napoleonic Wars in Germany, Portugal and Spain. He served at the siege of Copenhagen and Corunna, Walcheren, Barossa, Arroyomolinos, Almaraz, Vittoria, the Nive, Toulouse and Waterloo; and later served in the Ionian Islands. On returning to England Peter farmed at Gagham, Chittlehampton; there are no buildings remaining to day, but evidence of a structure was noted in 1960. The area is now completely ploughed out. He eventually married a Rebecca Arthur on 6 November 1823 in Filleigh, Devon. Rebecca had been born about 1799 in Swimbridge, Devon. Peter died 20 June 1844 in Chittlehampton, Devon. The cause of death was recorded as `A rupture of a vessel in the heart’; he was buried in Chittlehampton churchyard. Rebecca, who was Schoolmistress at Chittlehampton in 1851, was buried on 21 June 1857 in Chittlehampton. 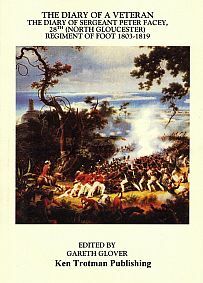 The only previously published memoirs from the 28th Foot during the Napoleonic wars, that I am aware of, are those of Captain Robert Blakeney who served with the 28th from 1804 until 1812, when he joined the 36th Foot; and William Thornton Keep who served with the regiment from 1811-14. However, Peter Facey’s account, although dealing with much of the same material, is able to add the much rarer view point of a ranker and his account also continues with the regiment throughout the remainder of the war including Waterloo. After reading the diary one wonders how a sergeant came to have the education and vocabulary necessary to write such an interesting account of his adventures and how he gained access to such detailed knowledge of casualties and of stores captured unless he was attached to the regimental staff in some capacity. His is a fascinating account, full of detail and adds much to our knowledge of this regiment during the wars.